After hearing from Jim at YA Yeah Yeah that The Last Leaves Falling by Fox Benwell was a really good book, I was really interested to read it for myself. Unfortunately, it didn't really do it for me. Sora has ALS. He is going to deteriorate, lose control of his body, and eventually die. He is having a hard time coming to terms with this, especially when people look on him with pity. Sora's only solace is in the poems of long dead samurai, and talking to his online friends, who don't have to know about his condition - that is, until they meet. Sora is surprised to find that Mai and Kaito accept him for who he is, and still want him in their life. But as Sora progressively gets worse, he starts to question his quality of life. I found The Last Leaves falling really difficult to get into. There is such a lack of contractions it would really distract me while reading. Constantly reading "do not", "it is", "I am" was really jarring and stopped the story flowing well for me. Unless I was reading the book for a long period of time where I could get used to the writing style - which wasn't often as I read during breaks at work and travelling to and from most of the time - it was a continuous struggle. When talking about this on Twitter, Rhys of Thirst for Fiction said how it felt like an actual translated work, although it's not, and I have to agree. I also had trouble getting emotionally involved in the characters. There was something missing from this book for me that inhibited me from really caring, despite the subject matter. I just wasn't that bothered about Sora and his condition. The story was also a lot less about ALS (Amyotrophic Lateral Sclerosis, or Motor Neurone Disease as it's known in the UK) than I expected, too, and more about how Sora felt dealing with it, his emotional state. I was intrigued by how he was coping and what he thought about his uncooperative body, but I could have cared more than I did. I wanted to. It just wasn't working out that way for me. But this might have to do with the fact that I found the characters to be quite immature most of the time. They felt a lot young than their actual ages, more like they were all 13 rather than quite a few years older, and I found them really frustrating. There was a lot of eye-rolling while I was reading. It wasn't until the last third of the book that I got interested in any real way. I don't want to spoil the story, but it got more emotional, and only then did I start to feel something, did the story start to grab me. But by then it was too late, and the story was almost over. However, I did find it interesting how Benwell used the group emails sent by "The S Club", that were trying to convince teens to rebel against adults and take a stand over not being heard and being controlled by taking part in mass suicide. It was a good way of contrasting with the events of the book, and having the two side-by-side made you think. It did feel quite intentional though, like those emails were there for this purpose of juxtaposition, rather than something naturally occurring within the story, which I was a little sad about. I really enjoyed learning about the Japanese culture, it was really quite interesting reading about the samurais' poems, hearing the superstitions, the talk of food, and so on, but for a book set in Japan, there wasn't as much Japanese culture as I expected. The story was more about Sora and his condition, and his relationship with his friends, but I would have liked to understand and learn more. 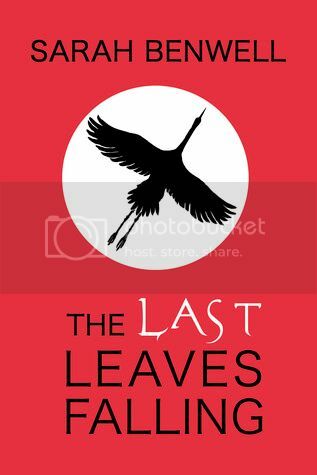 Unfortunately, The Last Leaves Falling was quite lacking in a lot of areas for me, and I finished it feeling really disappointing. However, I know there are people who really enjoyed it, so do check out some other reviews before deciding whether to read it or not. Thank you to Definitions at RHCB for the review copy.